The Purple Rain star - who famously once changed his name to a symbol and whose private life is surrounded by mystery - has started tweeting using the handle @3rdeyegirl, the name of his new band. Prince's first message to the Twittersphere was, "PRINCE'S 1ST TWEET... 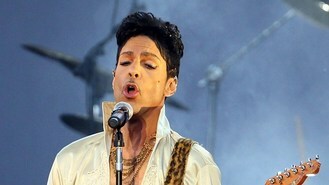 TESTING 1, 2..." followed by "PRINCE'S 2ND TWEET." His third tweet asked: "DID EYE ADD 2 MUCH PEPPER?" with a picture of a salad covered in pepper. He then posted a picture of himself in a new romantics-style shirt with long hair and medallion, holding a flower with the caption, "hi im prince". His "1st selfie" was a picture of a cloud of smoke. The 55-year-old singer later posted a link to his new track Groovy Potential on You Tube. Prince already has over 84,000 followers and is following nobody.